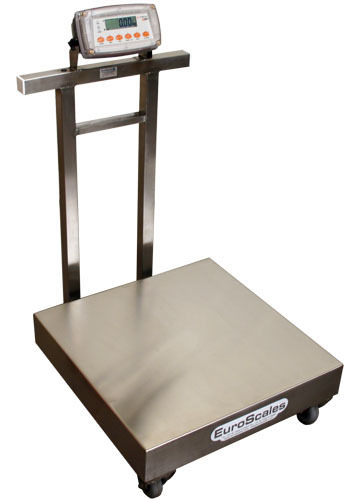 Capacity from 15kg upto 1000kg with a high accuracy of 0.1% of the applied load The Euroscales mobile platform scales as designed with rugged continuous use in mind for commercial and industrial applications. The X320 combines innovation in industrial design and engineering excellence to create an instrument that is ideal for use in food processing, automotive, chemical or pharmaceutical applications or applications that require reliable operation in harsh environmental conditions. The X320 is rated to IP69K which is the industry’s highest environmental protection rating. It has been designed to withstand cleaning with high pressure water jets (1450psi) at high temperatures (up to 80°C) from multiple angles Powering options include: 12-24VDC or 4 AA batteries. It can be panel, desk, wall mounted or mounted on a stand. The programmable function key can be configured for any one of the built-in functions (Counting, Manual Hold, Peak Hold, Live Weight Totalising). Assignable function key: Unit switching, counting, manual hold, peak hold and animal weighing. Size Standard Squares 400mm sq, 500mm sq, 600mm sq 800mm sq and 1000mm sq.